Protesters from a range of political groups have gathered in central Berlin for a protest against TTIP, a trade deal between the US and the European Union that critics say will benefit large corporations at the expense of average Europeans. Trade unions, environmental groups, charities and opposition parties were among the organizers of the rally, which went from the main railway station in central Berlin to the national parliament. According to activists, 250,000 people turned out for the event, while Berlin police claimed the number was closer to their initial expectation of 150,000. 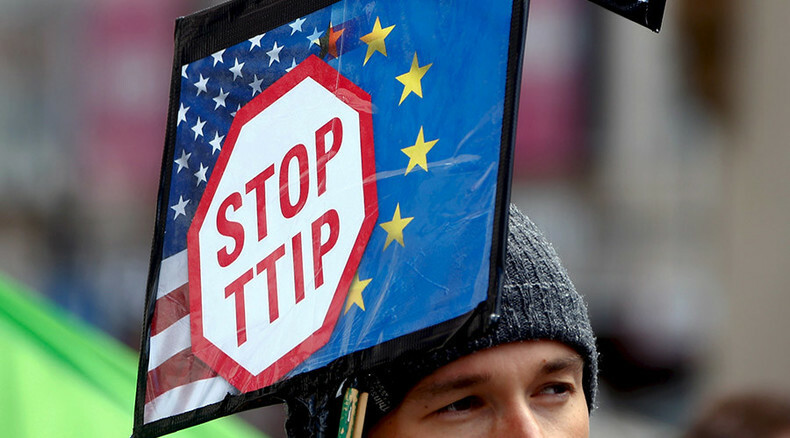 Marchers banged drums, blew whistles and held up posters reading "Yes, we can – Stop TTIP." One group dragged a giant wooden horse – a reference to the Trojan horse of Greek legend – to demonstrate how the trade deal is being sneaked into law by corporate lobbyists and EU officials through subterfuge. The Transatlantic Trade and Investment Partnership (TTIP) is meant to improve trade between the US and the EU, bringing tens of billions of dollars in extra profits to businesses. Critics fear that it would lead to worse safeguards in Europe, bringing down standards for consumer safety, food and health or labor rights down to those in America. European nations have stricter regulations for things like genetically modified foods or workers benefits than the US does. There is also discontent with the secretive nature of the negotiations, which prompts skeptics to assume the worst about the document they would eventually produce. A June opinion poll by Emnid showed that 36 percent of Germans saw TTIP as a bad thing, up from 25 percent in February last year, when the first such poll was conducted. The protest also targets Comprehensive Economic and Trade Agreement (CETA), a similar trade deal that the EU is negotiating with Canada, which would also be bad for Europeans, according to critics. There is a growing mistrust with the US in Europe’s leading country amid the scandal over mass electronic surveillance of Germans’ communications and the escalating refugee crisis, which many see as a result of failed American policies in the Middle East.